D-Day, June 6, 1944, was a turning point in World War II. The Allied Forces, which included 3 million British, American, and Canadian troops, invaded France and liberated Western Europe from Nazi Germany (Danzer, 574). When one reflects on the great American Generals who were pivotal in the success of this campaign, known as Operation Overlord, who comes to mind? Surely, Generals Eisenhower, Patton, and Bradley spring to mind. As the Supreme Commander of the U.S. Forces in Europe, General Dwight D. Eisenhower used his cunning tactics to trick the German Army into believing that the Allies would invade from Calais, the closest point from England, rather than in Normandy. General Omar Bradley led forces on June 25, 1944 to penetrate the German line of defense at St. Lo. This allowed General George Patton and the Third Army to advance to Paris and liberate France. But what about Lieutenant General Harold Roe Bull? General Bull’s contributions were fundamental to success of Operation Overlord. It was General Bull, who oversaw the Supreme Headquarters Allied Expeditionary Force (SHAEF) meteorological staff, who provided the weather report that indicated that the terrible weather would break on June 6th. With this information, General Eisenhower gave the orders to invade. 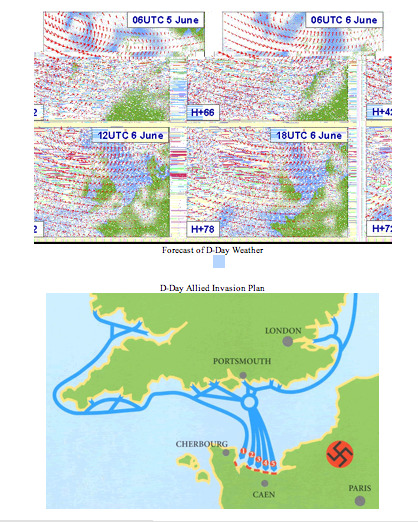 Had it not been for General Bull’s leadership in getting the weather information correct, the Allied ships might have departed on June 5th and been swamped in the seas, never reaching Normandy and therefore being unable to stop the German Army. There is more to General George R. Bull than being a “weather man.” He led a distinguished military career. Born in 1893, Harold Bull, nicknamed “Pink” was commissioned in the Infantry from West Point in 1914. During World War I, he served with American Expeditionary Force (AEF). Bull held the position of Secretary of War Department General Staff 1938-1939. His career culminated as Chief of Staff of U.S. Forces European Theater of Operation 1945-1946. As head of Operations as part of SHAEF, General Bull had an important role in planning military operations in Europe during World War II. For example, General Patton sought permission from General Bull to get the 10th Armored Division to take the city of Tier as part of the Eifel Campaign in 1943. Bull responded to Patton’s request with, “Okay…you can have the 10th Armored, but only for a single operation to clear the Triangle” (Farago, 747). Bull played a key role as a communicator. He is credited with drafting most of the messages for the Supreme Commander, General Eisenhower: “…drafted most of the directives as well as the sitreps to CCS, but only after full discussions with Eisenhower...” (Ambrose, 592). Bull rose to this high level in part because Eisenhower ranked him 14th among all US officers in European Theater (Stone, 259). After World War II, Bull continued in his role as a communicator. Attached to the Army General Staff, it was Bull who announced at a conference of 250 mayors in Manhattan in February 1948, that there were plans for a larger bomb, than those used at Hiroshima and Nagasaki; those bombs were considered “model T’s” by scientists (Time article). In addition to being a military strategist and communicator, Bull was also a military educator. He was an instructor at West Point from 1921-1924. Between 1928 -1932, Bull was an instructor at Infantry School 1928-1932. He was the Commandant of National War College after WWII. Bull’s military education prepared him for these roles in training and education. Bull graduated from Command and General Staff School in 1928. In 1933, he graduated from the Army War College. He wrapped up his education by graduating from the Naval War College in 1934. General Bull retired from the military in 1950 having received may many military honors, including included two Distinguished Service Medals, the Silver Star, Legion of Merit and the Bronze Star. He died in 1976 and is buried along side his wife, Elizabeth Alden Sheeden, and son, John Alden Bull, in Arlington Cemetery. While General Bull should be remembered for his military contributions in education, strategic planning, and communication, his role in leading his staff to predict the weather is perhaps the most important reason for which he should be remembered, because it turned the tide of events that took down the Nazis. Ambrose, Stephen. The Supreme Commander – The War Years of General Dwight D. Eisenhower. Double Day & Co: New York, 1970. Danzer, Gerald et. al. The Americans – Reconstruction to the 21st Century. Sacramento: CDE Press, 2006. Farago, Ladislas. Patton Ordeal and Triumph. Ivan Obolensky, Inc.: New York, 1964. "Progress.(Science)." Time 1 Mar. 1948: 68. General OneFile. Web. 17 Apr. 2010. Stone, Richard. “Bull, Harold Roe (1893-1976).” Encyclopedia of World War II. A Political, Social, and Military History,vol-I: A-C. California: ABC_CLIO, Inc, (2005), pp. 259.